Cells at Work! (はたらく細胞, Hataraku Saibō) is a Japanese manga series written and illustrated by Akane Shimizu. It features the anthropomorphized cells of a human body, with the two main protagonists being a red blood cell, and a neutrophil she frequently encounters. The manga was serialized in Kodansha's shōnen manga magazine Monthly Shōnen Sirius starting in March 2015. It is licensed in North America by Kodansha USA. An anime television series adaptation by David Production debuted from July 8 to September 29, 2018. A second season is in production. The story takes place inside the human body, where trillions of anthropomorphic cells each do their job to keep the body healthy. The series largely focuses on two such cells; a rookie red blood cell, AE3803, who often gets lost during deliveries, and a relentless white blood cell, U-1146, who fights against any germs that invade the body. A red blood cell who has just started her job, delivering oxygen, carbon dioxide and different nutrients all over the body. She meets Neutrophil when he saves her from an attacking pneumococcus bacterium. She is clumsy and gets lost often, but is determined to perform to the best of her ability. It is later revealed that she had encountered Neutrophil when they were younger, after he saved her from a bacterium. A type of white blood cell, whose job is to kill pathogens infecting the body. Despite his ruthless occupation, he's quite soft-spoken and gentle. When he was still in school as a young cell, he saved AE3803 from a bacterium after she got lost in a training exercise. A type of white blood cell that recognizes and kills various foreign matter and unhealthy cells. He is aggressive, pompous and rowdy, brutally taking pleasure in slaughtering pathogens and unhealthy cells. He especially looks down on white blood cells forming relationships with non-white blood cells, like Neutrophil's close friendship with Red Blood Cell. He is the sergeant of the Killer T Cells and is a harsh teacher to his students, the Naive T Cells. He has negative relationships with Helper T Cell and NK Cell, the former being his superior in the Killer T Division. In his youth, he was considered to be weak like the rest of the young T Cells, being only able to survive and complete training through the help of Helper T Cell, which at least made him stronger. A type of white blood cell. She and her kind appear as lovely maids in big dresses, armed with a variety of large weapons to fight various invasive pathogens, and are often shown smiling cheerfully even in the middle of combat. While inside blood vessels, she and her kind take on the role of monocytes, and wear hazmat suits over their dresses. A type of cell responsible for reconstructing the body after various injuries. They are depicted as cute children, due to their small cell size, and act as construction and repair crew within the body. One platelet serves as their leader and she is most prominently featured in the show. A type of T Cell that determines strategy and courses of action for dealing with foreign invaders. He is the main commander of the Killer T Cells and has an intellectual and smooth disposition, putting him at big odds with the rough and tough Killer T Cell, despite having underwent T Cell training together with him. A type of T Cell that mediates and regulates the correct function and magnitude of immunological responses. She usually acts as Helper T Cell's secretary, though she is capable of fighting when necessary. She went through T Cell training alongside Killer T Cell and Helper T Cell. A rookie T Cell who is too frightened to fight invasive microorganisms, until Dendritic Cell helps him transform into Effector T Cell. He and his kind are the students of Killer T Cell, from whom they receive harsh treatment and austere training. A Naive T Cell transformed into a large, muscular and powerful T Cell. His design and mannerisms are a parody of the various male protagonists from JoJo's Bizarre Adventure. A type of white blood cell who is acquainted with White Blood Cell since they grew up in the same bone marrow. She feels inferior to the other immune cells because of her inability to fight off bacteria and viruses, but she shows her true worth by killing a parasitic Anisakis when the other cells could not. She handles a bident as her weapon of choice. Depicted as a messenger dressed in green stationed inside a call center resembling a tree. He can stimulate Naive T Cells and transform them into Effector T Cells. He owns a camera which he always uses to take pictures of events he deems important and stores them in picture albums, some of which are sources of shame and humiliation for the other cells. A paranoid and neurotic cell whose job is to remember past infections and allergies so that the immunity system can be ready for them. However, he is scatterbrained and it is difficult for him to sort out his memories, often panicking and screaming whenever disaster strikes. A cell whose job is to monitor and release histamines in response to allergic and inflammatory reactions. She always follows the instructions in her book no matter the situations and is unpopular due to her lack of consideration of what her actions do to the other cells. Also known as "Fat Cell", she gets irked whenever she is referred to with that name. An older red blood cell who sometimes guides and teaches AE3803 on how to properly perform her occupation. A white blood cell who carries a weapon that shoots antibodies. He is often annoyed and jealous about not receiving as much credit as the Killer T Cells do. He also has an antagonistic relationship with Mast Cell, as their combined functions only cause grave disasters for the other cells. A mysterious and poetic character whose real occupation is unknown, appearing during a food-borne infection to make cryptic commentaries on the disastrous events unfolding. She patrols the whole body for viruses, bacteria and abnormal cells, with her weapon of choice being a machete. She has a smug demeanor, is somewhat condescending towards other cells and her relationship with Killer T Cell is akin to that of an intense sibling rivalry. An antagonistic cell bent on creating a world where cells no longer have to kill each other, even if it means risking the life of the body. He appears in only two episodes in the anime, but is a recurring character in the manga. The manga was launched in Kodansha's shōnen manga magazine Monthly Shōnen Sirius in March 2015. Kodansha has collected the manga into five tankōbon volumes as of August 2017[update]. The manga received a spinoff in the May 2017 issue of Nakayoshi called Hataraku Saikin (はたらく細菌; "Bacteria at Work") by Haruyuki Yoshida, which follows the lives of good and bad bacteria in the intestines. Another spinoff, titled Hatarakanai Saibō (はたらかない細胞; "Cells That Don't Work") by Moe Sugimoto, about immature red blood cells (erythroblasts) that do not want to work, was launched in the September 2017 issue of Monthly Shōnen Sirius. The manga received another spinoff titled Hataraku Saibō Black (はたらく細胞 BLACK), set in a "black" environment of a human body suffering an unhealthy lifestyle, that runs in Weekly Morning since June 7, 2018. It is written by Shigemitsu Harada, with illustrations by Issei Hatsuyoshi and supervision by Shimizu. The manga received another spinoff titled Hataraku Saibō Friend, which centers around a Killer T Cell who is normally strict with himself and others, but wants to have fun during his free time. He also wants to make friends but does not want to ruin his reputation. The series began running in Bessatsu Friend on January 12, 2019. It is written by Kanna Kurono, and illustrated by Mio Izumi. Kodansha USA announced that it had licensed Cells at Work! in North America on March 21, 2016. The manga is also licensed in Taiwan by Tong Li Publishing. Kodansha USA also announced that it has licensed Cells at Work! Code Black. An anime television series adaptation was announced in January 2018. It is directed by Kenichi Suzuki and animated by David Production, with scripts written by Suzuki and Yūko Kakihara, character designs by Takahiko Yoshida, and music by Kenichirō Suehiro. The anime series premiered on July 8, 2018 on Tokyo MX and other channels. The series ran for 13 episodes. Aniplex of America licensed the series in North America and simulcast it on Crunchyroll. The series was simulcast in Australia and New Zealand on AnimeLab, while Animax Asia simulcast the series for the Southeast Asia region. MVM Entertainment acquired the series for distribution in the United Kingdom and Ireland. The opening theme is "Mission! Ken - Kō - Dai - Ichi" (ミッション！ 健・康・第・イチ, Mission! Health First) by Kana Hanazawa, Tomoaki Maeno, Daisuke Ono, and Kikuko Inoue, while the ending theme is "CheerS" by ClariS. A special episode premiered on December 27, 2018. On March 23, 2019, the official Twitter account announced that the series will receive a second season. Inside a human body, a red blood cell, named AE3803, is rescued from a sudden attack from a group of Pneumococcus bacteria by a white blood cell, named U-1146. Later, as AE3803 tries to find her way to the lungs to make the delivery, she discovers one of the bacteria has escaped and is planning an attack on the lungs, so she and U-1146 accompany each other to the lungs to pursue it. Upon reaching the lungs and parting ways with U-1146, AE3803 discovers Pneumococcus had been hiding in her package the entire time, waiting to target red blood cells for their nutrients. However, U-1146, who had caught onto the bacterium's plan, arrives in time and lures the bacterium into a trap, where he is ultimately sneezed out of the lungs. The red blood cells find themselves in trouble when the vessel they are travelling on is broken by a skin abrasion, with U-1146 and the other white blood cells forced to deal with all the germs that come through as a result. As the bacteria plot to eliminate all the neutrophils before backup can arrive, the white blood cells manage to hold them off while the platelets arrive to clot the wound, preventing more germs from getting inside. Naive T Cell is patrolling the body for influenza virus proliferation. But since he's never taken on the enemy before, he's completely terrified and useless. He finally ends up fleeing the battlefield, where the veteran Killer T Cells, Neutrophils and Macrophages are battling. Naive T Cell is filled with self-loathing until Dendritic Cell sees him and speaks to him kindly. This encouragement transforms him into Effector T Cell, a much braver and stronger form that joins the other immune cells in wiping out the influenza virus. However, a surviving virus mutates into Type A and proliferates again, so the fighting goes on. A band of Vibrio bacteria invades the stomach. Basophil warns the immune cells about it, but confuses everyone by speaking cryptically. The immune cells defeat the invaders, but one of them, Eosinophil, was unable to land any good hits and had to be rescued. The other cells mock her as a weakling, except AE3803 and U-1146. The stomach then gets invaded by a massive Anisakis parasite. The immune cells are no match for it, but Eosinophil explains she is designed to battle parasites and kills it with a single stab. The other cells apologize for making fun of her and praise her as a heroine. The body inhales cedar pollen, which unleashes gigantic allergens. Though U-1146 points out the creatures are mindless and non-malicious, Memory Cell claims they bring impending doom. B Cell easily defeats the allergens, but Mast Cell releases a profuse amount of histamines within the body, which causes violent allergic reactions that damage the surroundings. Just as everyone blames Mast Cell for the destruction, the body takes a steroid to treat the allergy. The steroid appears in the form of a robot that indiscriminately destroys its surroundings until it loses power. The survivors realize all of this was caused by following Memory Cell's claims and trying to attack the allergens. AE3803 gets lost again and finds herself in her birthplace, the Red Bone Marrow. She reminisces on being a young Erythroblast being trained by a Macrophage on how to be a Red Blood Cell. One day, while practicing to evacuate from bacteria, she got lost and was separated from the others. She got captured by a Pseudomonas bacterium who intended to torture and kill her before moving on to other blood cells. A young Myelocyte came to her rescue, and although no match for the bacterium, bought enough time for Macrophage and a Neutrophil to arrive and kill the bacterium. She thanked the Myelocyte for helping her and they went their separate ways hoping to someday see each other again. In the present, she runs into U-1146. As he offers to guide her to her destination, she suspects the Myelocyte who saved her grew up to be U-1146. Later, U-1146 saves a Normal Cell from a Cancer Cell. The Normal Cell explains there are more Cancer Cells in his apartment complex. The Normal Cell leads U-1146, Killer T Cell, and NK Cell to his apartment, but Killer T Cell continually trades spats with NK Cell and stubbornly refuse working with her. The group splits up and once they are alone, NK Cell reveals she knew the Normal Cell was actually a Cancer Cell in disguise. NK Cell battles the Cancer Cell, who is able to shapeshift and spread into the surrounding environment. Meanwhile, U-1146 and Killer T Cell run into Cancer Cell's multiplying clones. The Cancer Cells order massive quantities of nutrients to be delivered to the apartment to greedily sustain themselves, but AE3803 feels suspicious and alerts the rest of the immune system. U-1146, Killer T Cell and NK Cell are cornered and about to be killed, until the other immune cells arrive. All the Cancer Cells are wiped out, with NK Cell delivering the final blow against the original one, but he vows revenge before dying in front of U-1146. AE3803 becomes tired of always getting lost and resolves to circulate the body without guidance. After a difficult journey, she manages to travel through the heart, then the lungs to exchange carbon dioxide with oxygen, then to the body's cells to exchange oxygen with carbon dioxide. U-1146 clandestinely followed her and helped return her dropped notes and hat, then killed some germs who tried to ambush her, all without her noticing his presence. U-1146 later tells Killer T Cell that he has gained an appreciation for all the hard work the Red Blood Cells do every day and hopes the immune cells can live in harmony with other cells, but Killer T Cell angrily punches him and orders him to get back to work. AE3803 meets U-1146 and tells him how her day went. Killer T Cell walks around seeing several immune cells mingling with other cells and irritably denies being envious. As Killer T Cell and Helper T Cell get into an argument about the former's harsh training methods, Dendritic Cell shares his photo album with the Naive T Cells and explains the two's shared past. While training in the Thymus, the future Helper T Cell and Regulatory T Cell easily passed all the hand to hand combat and obstacle courses, but the future Killer T Cell struggled. The future Helper T Cell was disdainful of him for this, but eventually gave him advice that helped him pass the final test. Killer T Cell vowed to become a worthy defender of the body, while Helper T Cell decided to become a commander. In the present, Killer T Cell and Helper T Cell notice the photo album. Severely embarrassed, they both try unsuccessfully to take it from Dendritic Cell in order to burn it. Regulatory T Cell muses that they are both still morons as they were in training. AE3803 is rescued from a germ by a mysterious immune cell called Monocyte, who doesn't speak and wears a hazmat suit. Later, the nasal cavity gets invaded by a band of Staphylococcus aureus. Vowing revenge for one of their number who was killed in "Scrape Wound", they combine their bodies into a powerful giant who is able to trap the white blood cells in a net of fibrin. A squad of Monocytes appears and sheds their hazmat suits to reveal that they are Macrophages; Monocytes being one of the many roles they play. The Macrophages easily defeat the invaders. As the white blood cells thank the Macrophages for saving everyone, AE3803 asks one of them how they fit their enormous dresses inside the hazmat suits, but she tells her it is a secret. The body suffers from heat stroke, leading to a heat wave inside and the supply of fluids being depleted. To make matters worse, a Bacillus cereus bacterium, who is not bothered by the heat, invades the body. While the other cells struggle to cope with the extreme heat, U-1146 pursues the bacterium, but grows fatigued. Just when it seems that all is lost, the body gets an injection of fluids, reviving everyone and allowing U-1146 to kill the bacterium. AE3803 is assigned to be a mentor to a new red blood cell named NT4201, but finds herself out of her depth. AE3803 gets embarrassed when she gets them lost several times and finds that NT4201 seems to already know about the body, and that she prefers to do her job as efficiently as possible and not associate with non red blood cells. The body suffers a head injury which results in massive blood loss. NT4201 starts to panic due to the change in her perfect schedule, but AE3803 manages to get her back on track. As the body temperature begins to drop, U-1146 defeats germs that entered through the injury, then is horrified to realize the number of red blood cells have depleted. The platelets struggle to seal the head wound, but increased blood pressure causes even more blood cells to be lost. With so few red blood cells, there are not enough to deliver oxygen to all the cells, and they start to die. The body temperature drops drastically, leading to a blizzard inside. NT4201 falls into despair, and rants that their actions are pointless and the body will die, but AE3803 refuses to give up. The body receives a blood transfusion. The new red blood cells, though confused by their new surroundings, agree to help deliver oxygen, saving the body. As the body's structures are rebuilt, NT4201 apologizes for looking down on AE3803. AE3803 and everybody else gets back to their normal routine. A Normal Cell who is bored of his monotonous duties and annoyed by his rowdy Killer T Cell neighbors is befriended by a mysterious cell who doesn't speak and wears a strange hat. The two have fun pulling pranks on various cells. Eventually, the stranger reveals himself to be a cell infected by a virus, with his hat being the replicating virus. He attempts to infect the Normal Cell, but the immune cells arrive in time to wipe out the virus. After identifying the virus as Rhinovirus (The Common Cold), the immune cells lecture the Normal Cell to study so that he can identify pathogens in the future. Now appreciative of his neighbors, the Normal Cell invites the immune cells to a game of badminton. A light novel adaptation of the manga titled as Shōsetsu Hataraku Saibō (小説　はたらく細胞) was published on July 12, 2018 by Kodansha. It is written by Yui Tokiumi and illustrated by Akane Shimizu. A stage play adaptation titled Tainai Katsugeki Hataraku Saibō (体内活劇「はたらく細胞」) was announced in the August issue of Kodansha's Monthly Shōnen Sirius magazine. The play was held at Tokyo's Theatre 1010 from November 16 to 25. The play which was directed by Tsuyoshi Kida, starred Masanari Wada as U-1146 and Kanon Nanaki as AE3803, while Keita Kawajiri wrote the script for the play. The last performance, which was held on the 25th, was also distributed live. A game app for iOS and Android mobile devices titled Always Cells at Work (いつでも はたらく細胞, Itsudemo Hataraku Saibō) has been announced and is accepting pre-registration for players. Rebecca Silverman of Anime News Network highlighted the educational aspect of the manga despite flaws in presentation of information, and ultimately found the manga entertaining with likable characters. Sean Gaffney of Manga Bookshelf called it a "very fun shonen action manga", complimenting the manga's ridiculousness and humor. The 2016 Kono Manga ga Sugoi! guidebook listed the manga as the seventh top manga for male readers. Paul Gravett included the manga in his list of "Top 22 Comics, Graphic Novels & Manga" for October 2016. As of July, 2017, the manga had over 1.3 million copies in print. The manga had over 1.5 million copies in print, as of January 2018. Dr. Satoru Otsuka, postdoctoral fellow in the molecular neuro-oncology department of Emory University School of Medicine in Atlanta, Georgia, praised the series' depiction of cancer cells during the series' seventh episode. Biology teachers at a high school affiliated with China's Southwest University were so impressed with the accuracy of the series, they assigned it as homework for their students. ^ "Cells at Work! Vol. 1". ComiXology. Retrieved August 30, 2018. ^ "The Summer 2018 Anime Preview Guide - Cells at Work!". ^ a b c d e "Cells at Work! TV Anime Stars Tomoaki Maeno, Kana Hanazawa". Anime News Network. January 25, 2018. Retrieved January 25, 2018. ^ a b c d "Cells at Work Casts Takahiro Sakurai, Saori Hayami, M.A.O, Nobuhiko Okamoto". ^ a b c d e Ressler, Karen (May 25, 2018). "Cells at Work Reveals Additional Cast, Opening Theme Song, July 7 Premiere". Anime News Network. Retrieved May 25, 2018. ^ a b "Cells at Work Anime's Video Reveals More Cast Members". Anime News Network. June 17, 2018. Retrieved June 17, 2018. ^ "はたらく細胞 STAFF/CAST". テレビアニメ「はたらく細胞」 (in Japanese). Retrieved 20 August 2018. ^ Cells at Work! 5. Kodansha Comics. 2017-09-21. pp. 168–170. ISBN 9781632364265. ^ a b "Kodansha Comics Licenses The Prince in His Dark Days, Cells at Work! Manga". Anime News Network. Retrieved 4 June 2017. ^ a b はたらく細胞 (5). Kodansha. Retrieved 22 November 2018. ^ "CiNii Books 著者 - 吉田, はるゆき". ci.nii.ac.jp (in Japanese). Retrieved 2018-11-09. ^ "Cells at Work! Manga Gets Spinoff Focusing on Intestinal Bacteria". Anime News Network. Retrieved 4 June 2017. ^ "「はたらく細胞」の腸内版！スピンオフ「はたらく細菌」がなかよしで開幕 - コミックナタリー". コミックナタリー (in Japanese). 2017-04-03. Retrieved 2018-11-09. ^ "Cells at Work Manga Gets New Spinoff About Cells That Don't Work". Anime News Network. Retrieved 19 January 2018. ^ Sherman, Jennifer (May 18, 2018). "Cells at Work! Gets BLACK Spinoff Manga in June". Anime News Network. Retrieved May 18, 2018. ^ Pineda, Rafael Antonio (January 11, 2019). "Cells at Work Gets New Spinoff Manga on Saturday". Anime News Network. Retrieved January 12, 2019. ^ 工作細胞. Tong Li (in Chinese). Retrieved 4 June 2017. ^ "Fall 2019 New Licensing Announcements from Kodansha Comics + Vertical". Kodansha Comics. 2019-03-11. Retrieved 2019-03-23. ^ はたらく細胞 (1). Kodansha. Retrieved 9 October 2017. ^ Shimizu, Akane (2016). Cells at Work! 1. ISBN 978-1632363565. ^ はたらく細胞 (2). Kodansha. Retrieved 9 October 2017. ^ Shimizu, Akane (2016). Cells at Work! 2. ISBN 978-1632363572. ^ はたらく細胞 (3). Kodansha. Retrieved 9 October 2017. ^ Shimizu, Akane (2017). Cells at Work! 3. ISBN 978-1632363909. ^ はたらく細胞 (4). Kodansha. Retrieved 9 October 2017. ^ Shimizu, Akane (2017). Cells at Work! 4. ISBN 978-1632363916. ^ Cells at Work! 5. ISBN 978-1632364265. ^ Cells at Work! 6. ISBN 978-1632364272. ^ はたらく細胞BLACK (1). Kodansha. Retrieved 28 August 2018. ^ はたらく細胞BLACK (2). Kodansha. Retrieved 29 August 2018. ^ はたらく細胞BLACK (3). Kodansha. Retrieved 13 February 2019. ^ "Cells at Work! Manga Gets TV Anime in July". Anime News Network. 19 January 2018. Retrieved 19 January 2018. ^ "Cells at Work Anime Listed With 13 Episodes". Anime News Network. July 7, 2018. Retrieved July 7, 2018. ^ Ressler, Karen (June 19, 2018). "Aniplex USA Announces Yuuna and the Haunted Hot Springs, Cells at Work! Anime for Crunchyroll Streaming". Anime News Network. Retrieved June 20, 2018. ^ Bortignon, Tegan (July 3, 2018). "AnimeLab Summer Simulcast Lineup 2018!". AnimeLab. Retrieved October 27, 2018. ^ Pineda, Rafael Antonio (June 28, 2018). "Animax Asia to Simulcast Cells at Work! Anime". Anime News Network. Retrieved November 19, 2018. ^ MVMEntertainment [@MVM_UK] (October 27, 2018). "Update time - here's what you can expect from us in 2019! Our newest titles will be Cells At Work, Record of Grancrest Wars, Sagrada Reset, Starmyu, Seven Mortal Sins and Scum's Wish. 1/2" (Tweet). Retrieved October 27, 2018 – via Twitter. ^ "ClariS Performs Cells at Work! TV Anime's Ending Song". Anime News Network. May 3, 2018. Retrieved May 4, 2018. ^ a b "Cells at Work! Anime Gets New Episode on December 26, Game App". Anime News Network. November 18, 2018. Retrieved November 18, 2018. ^ Hodgkins, Crystalyn (March 23, 2019). "Cells at Work! Anime Gets 2nd Season". Anime News Network. Retrieved March 23, 2019. ^ Aniplex USA [@aniplexUSA] (December 19, 2018). "Cells never sleep! Cells at Work returns for a Special Episode, "The Common Cold," next week on @Crunchyroll !" (Tweet). Retrieved December 22, 2018 – via Twitter. ^ 小説　はたらく細胞. Kodansha. Retrieved November 15, 2018. ^ Hodgkins, Crystalyn (June 25, 2018). "Cells at Work Manga Gets Stage Play". Anime News Network. Retrieved October 28, 2018. ^ Sherman, Jennifer (July 5, 2018). "Cells at Work! Stage Play Reveals Cast, Staff, November Run". Anime News Network. Retrieved October 28, 2018. ^ Pineda, Rafael Antonio (July 26, 2018). "Cells at Work Stage Play Reveals 2 Main Cast Members in Costume". Anime News Network. Retrieved October 28, 2018. ^ Pineda, Rafael Antonio (August 8, 2018). "Cells at Work Stage Play Announces 16 More Cast Members". Anime News Network. Retrieved October 28, 2018. ^ Sherman, Jennifer (November 9, 2018). "Cells at Work Stage Play Reveals 2nd Main Visual". Anime News Network. Retrieved November 9, 2018. ^ Silverman, Rebecca. "Cells at Work!". Anime News Network. Retrieved 4 June 2017. ^ Gaffney, Sean. "Cells at Work!, Vol. 1". A Case Suitable for Treatment. Retrieved 4 June 2017. ^ "Kono Manga ga Sugoi! Reveals 2016's Series Ranking for Male Readers". Anime News Network. Retrieved 4 June 2017. ^ "Top 22 Comics, Graphic Novels & Manga: October 2016". Paul Gravette. Retrieved 4 June 2017. ^ Komatsu, Mikikazu. "'Cells at Work!' Manga Gets Anime CM for Its 5th Volume Release". Crunchyroll. Retrieved 9 December 2017. ^ Komatsu, Mikikazu (18 January 2018). 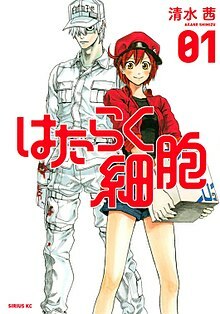 "'Hataraku Saibou' TV Anime Adaptation Set to Premiere in July 2018". Crunchyroll. Retrieved 28 August 2018. ^ Valdez, Nick (26 August 2018). "Scientists Praise 'Cells at Work!' for Its Entertaining Accuracy". ComicBook.com. Retrieved 28 August 2018. ^ Shen, Alice (17 August 2018). "Why new Japanese anime series 'Cells At Work!' is a big hit in China (It's in the science)". South China Morning Post. Retrieved 28 August 2018. This page was last edited on 2 April 2019, at 06:18 (UTC).